I have mentioned before that I am not much of a sweets eater, but give me chips and salsa and I am a happy lady! This recipe is for a large quantity that will be canned and ready for the winter but you could easily adjust this to make a single batch. All the ingredients are to your taste, so work around with it and make it according to your own preferences. Working in batches, place the tomatoes in a food processor fitted with the blade attachment and chop to desired consistency. 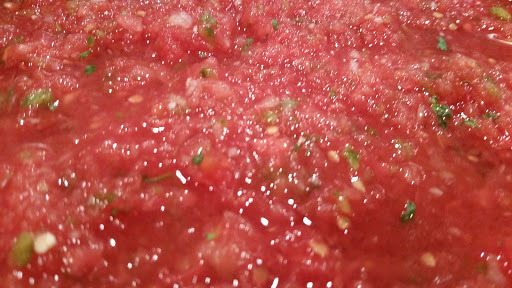 I do not like a watery salsa, so I squeeze most of the juice out of the tomatoes before placing them in the food processor. Place into a very large pan that will hold all the ingredients and can be heated. This is the pan I used. 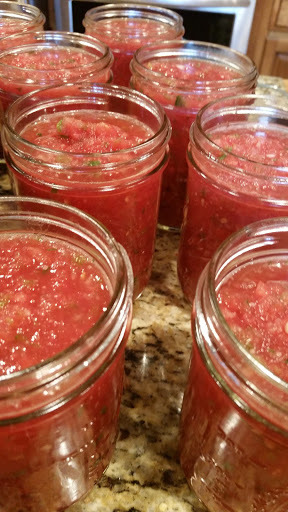 I’m not sure what it is called, but it is my best friend in canning season. Next, add the peppers, onions, garlic, and cilantro to the food processor and pulse until finely chopped. Add this mixture to your tomatoes. Add the lime juice and salt to the mixture and mix well. Taste and adjust your seasonings. Heat over medium heat stirring frequently for 20 minutes. 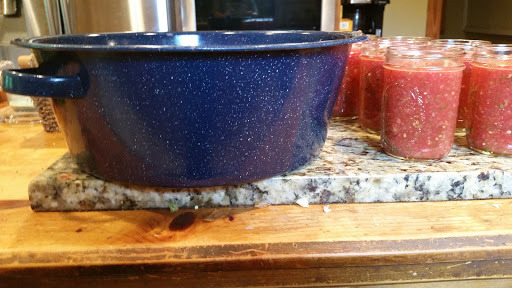 Ladle into sterilized jars, wipe the rims, place the lids, and process in a boiling water bath for 40 minutes. A little FYI note here. Peppers vary greatly in intensity of heat. For whatever reason, our jalapenos this year have been “KNOCK YOUR SOCKS OFF” hot! Thankfully, I tasted before I added more, otherwise the mister would never have gotten to taste this deliciousness! You can also vary the different types of peppers. It actually adds additional layers of heat and flavor, but I used what I had available and it is wonderful! This yielded 11 pints and some left over for me to snack on *insert big grin*.